! !FREE BUFFET DINNER EVERY NIGHT!! 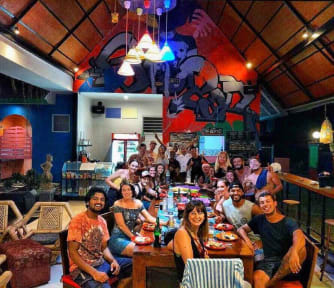 SR hostel knows what the backpacker wants: A cheap and comfortable place to sleep, a place to meet other backpackers and exactly the right amount of party nights and chill nights. As a cherry on the pie, SR hostel offers a free buffet dinner every night. Wait... Did you hear that right?! YES, you did: FREE DINNER EVERY SINGLE NIGHT! It's a free buffet for every guest staying here, whether you're vegetarian or a meat eater: there's something for everyone. We are located in the east part of Uluwatu, so let's explore the extraordinary beaches that not everyone goes to. Everybody goes to Padang Padang beach, but this is full of other tourists. Let's together explore the quiet, beautiful beaches in the south. Geger Beach, Gunung Payung Beach, Green Bowl Beach, and Melasti Beach are within 10 minutes scooter drive from the hostel and are the perfect place to go tanning, swimming, paragliding, and most importantly: Surfing! From here you also can explore another beache like Balangan beach, a beautiful place, perfect for the beginner surfer but also for the intermediate surfers among us. Another 15 minutes drive away is Uluwatu beach, for the pro surfers staying at SR hostel. As Uluwatu is spread out, and there is a lot to explore, you will need a scooter. At SR hostel you can rent scooters for only a few euros a day. If you're not an experienced scooter driver, we can arrange shuttle services for you or you can use GRAB or GO-JEK to get around. We can't wait to welcome you in our awesome hostel, and have a wonderful FREE DINNER together as one big family! a very nice place, the atmosphere is good, you will also see beautiful beaches, close to the beach, such as geger beach, pandawa beach, and gunung payung beach. You can also rent motorbikes at affordable prices. Good place for you to go, I recommend this place. Good atmosphere and a very clean hostel. Free dinner was so good! 10min away from beaches with a scooter, you can rent a scooter for a good price at the hostel. Would definitely go again! Love it and recommend.jero,the owner very helpful and friendly.the vegetarian free dinner very delicious for me.the staff also very helpful . I really enjoyed my stay here,such a great place! Very good vibes with nice people,super nice staff and the free dinner is delicious,even for me being a vegetarian. Would definitely recommend this place and will stay here again next time I’m in Bali. Nice hostel with a delicious food especially the free dinner with vegetarian food. Staff is very helpful and friendly, also the owner always try to the best as he can do for you. I will be back next time, of course. Was a great place to stay! The free dinner was outstanding, and the staff of very helpful. Went on a low season - so not much of an atmosphere. For one night, it was perfect! Nice hostel. A bit out of the way but no problem to reach any area by scooter. Free dinner was delicious and a nice touch. The owner is very friendly and eager to help. However, did find a bed bug on myself while sleeping and woke up with bed bug bites the next morning.